Are you ready for some action? Are you ready for another review from the illest AFOL on the streets? 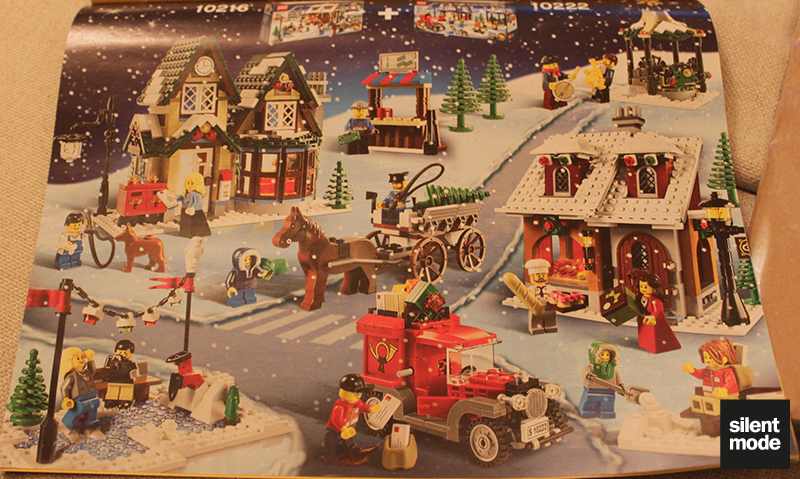 I’m not actually ill, just a little tired and sleepy from building this set – but let’s do this. This particular set was released yesterday, and I picked it up yesterday. (I was actually looking for this other, “exclusive” set that had been mentioned here on EB – which turned out to be the Kingdoms Joust set.) 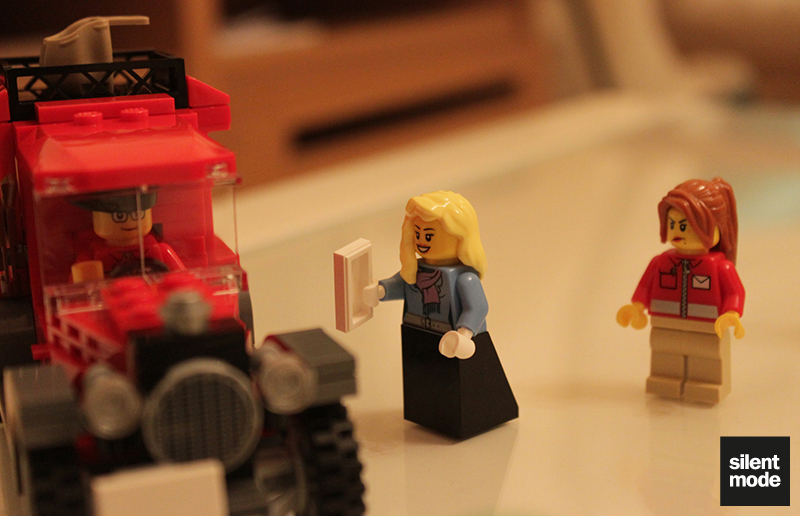 A quick conversation with one of the staff at the Lego store revealed they’d been stockpiling these for “several weeks”. 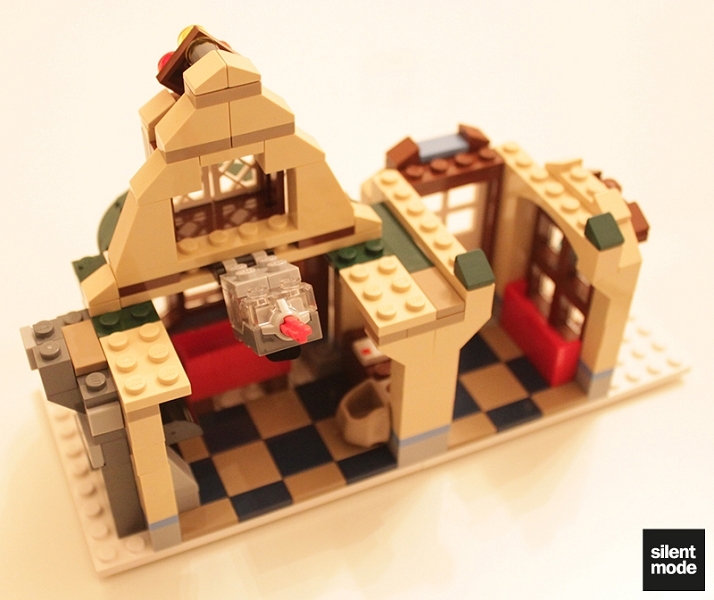 Following the success of last year’s Winter Village Toy Workshop and Winter Village Bakery, this year’s Winter set takes us to the Village Post Office: a small building in a sleepy rural village, reminiscent of Groundhog Day. Actually, this building reminds me of one of the entries from last year’s EB winter competition – didn’t someone make a Winter Post Office? 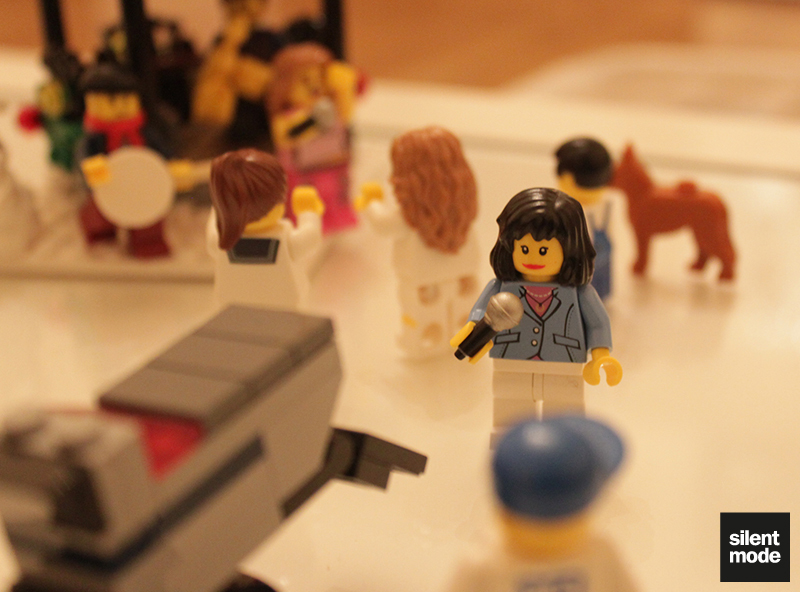 On one side, along with the lengthy part counts, one of the minifigures is featured. 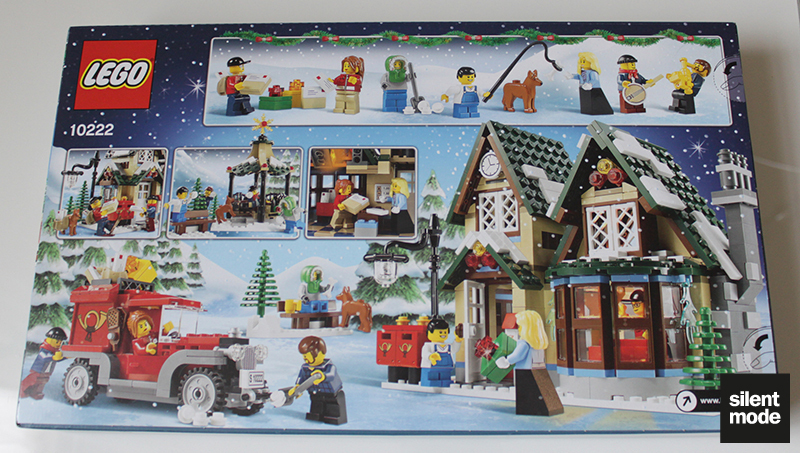 Another side of the box shows this set’s multicultural heritage. And yes, China is involved. 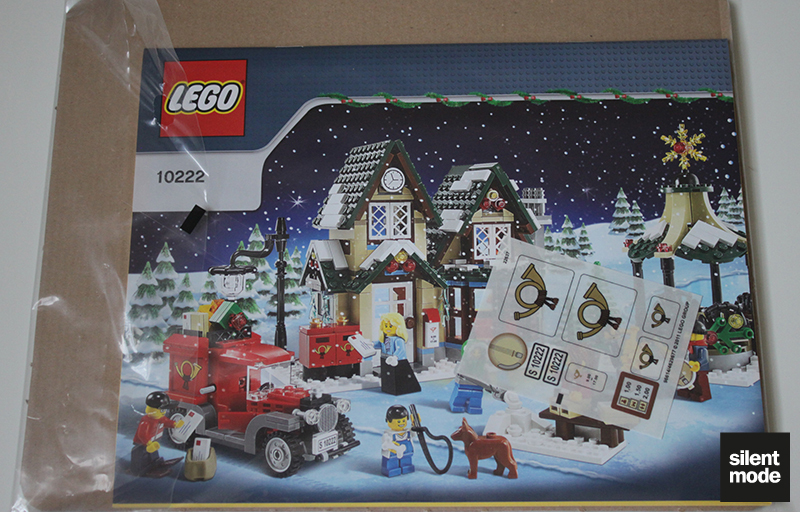 The main feature of this set is highlighted in the bottom right corner of the front of the box: the very special light brick. 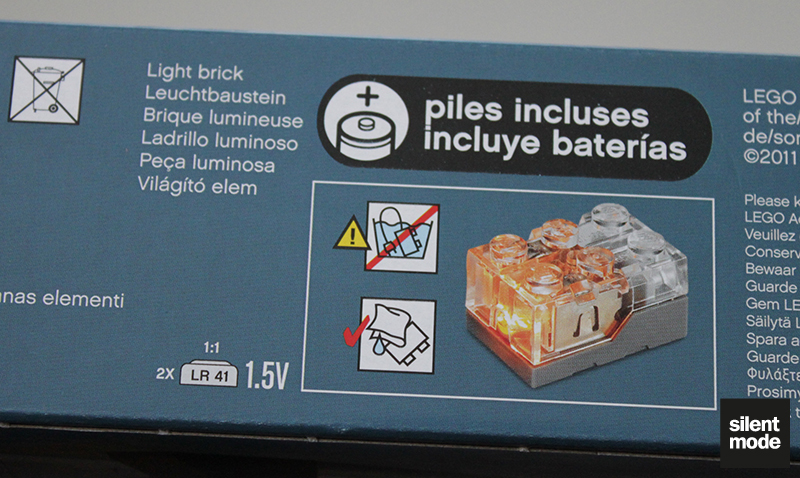 This will be my first ever light brick. So now we’re going to open the box and reveal the contents. Get ready to have your mind blown. The box itself feels rather lop-sided when you take it from the shelf, but once you see the contents you’ll understand why. The nine bags fill the box reasonably well, with little air inside. 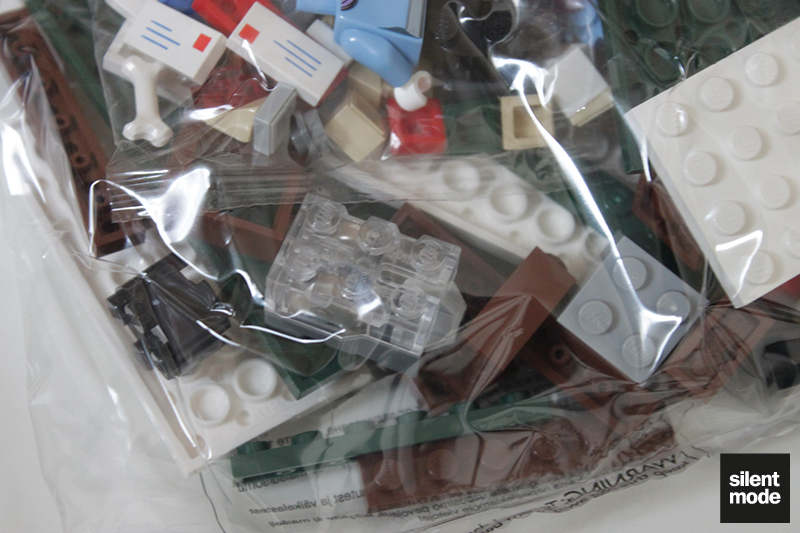 Here’s a close-up on one of the bags, which shows there are numerous small pieces to contend with. Medium blue features prominently here, which is one of my favourite “new” colours. The manual is packed in its own bag, along with the DSS (dreaded sticker sheet?). They are both kept flat with the aid of a sturdy piece of cardboard. 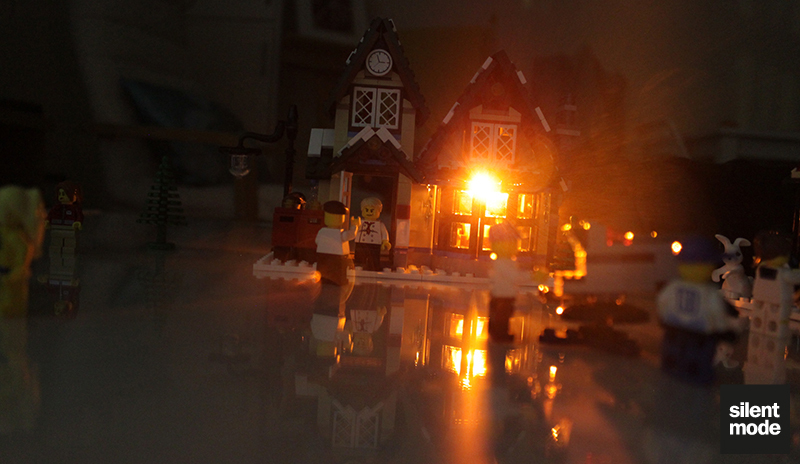 Hidden in one of the large bags of parts is the star of the show (apart from the actual star), the light brick. There’s a very small black tab underneath the brick that prevents it from lighting up until it’s pulled out. Also in the instructions, at the very front, are steps to replace the cell battery. 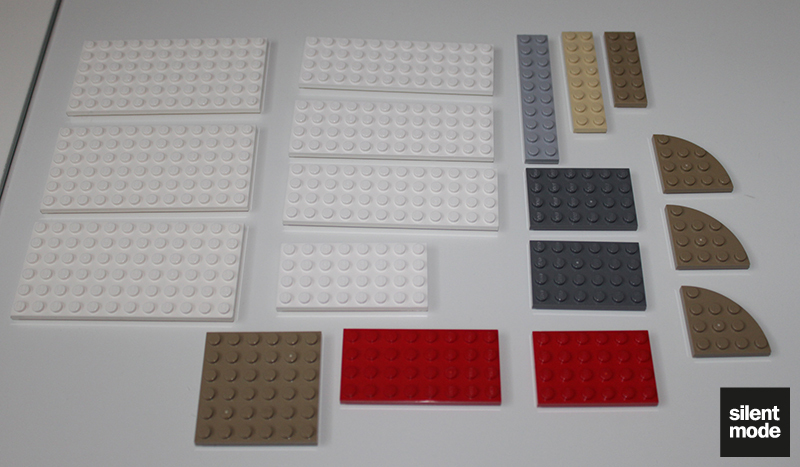 Here I’ve shown some of the many large plates that will be used to build the set; the largest are three 6×12 white plates, which serve as bases. Dark green is probably the most in-demand but rare “new” colour, and this set doesn’t disappoint. This brings back memories of the “mosh pit” at this year’s AFOLcon: before I could even figure out what was going on, dark green elements were the first to disappear. Many an injury was incurred during my visits to the pit, and till this day I’m suffering from “stud strife”. If dark green’s not your thing, check out this interesting selection of blue and white tiles. 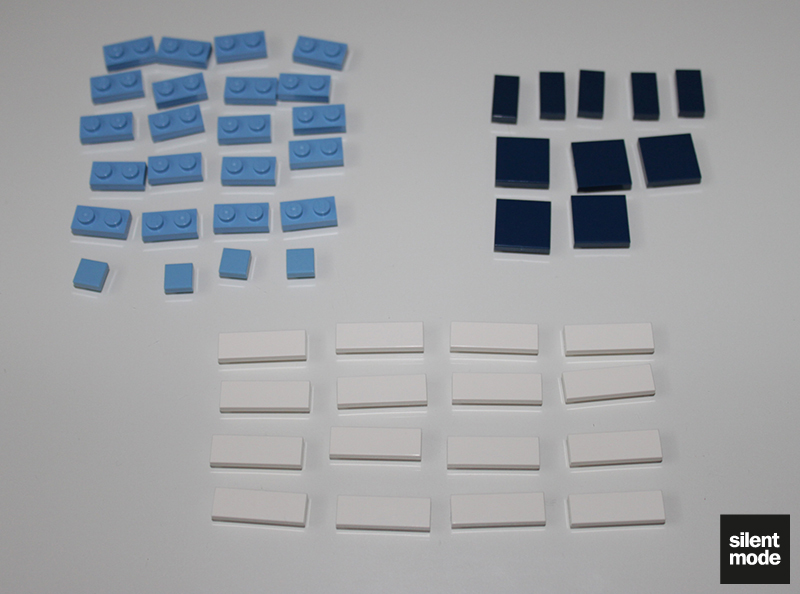 Dark blue and medium blue tiles look particularly attractive, while the set provides no less than 16 1×3 white tiles. 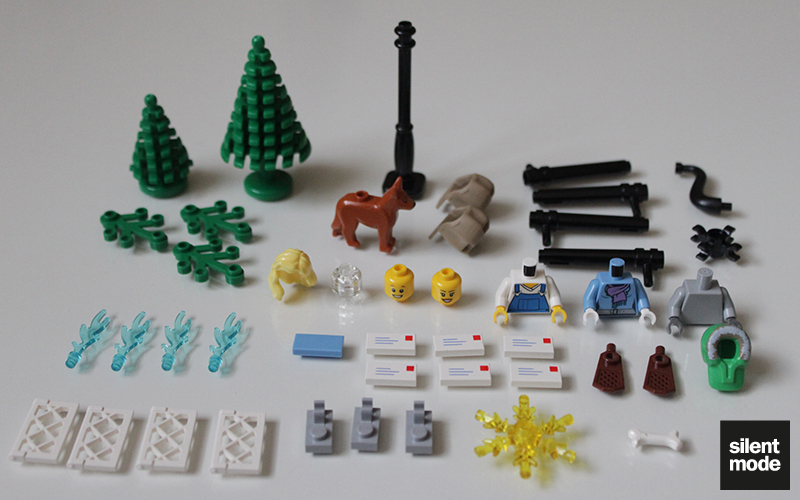 A selection of the even smaller parts. 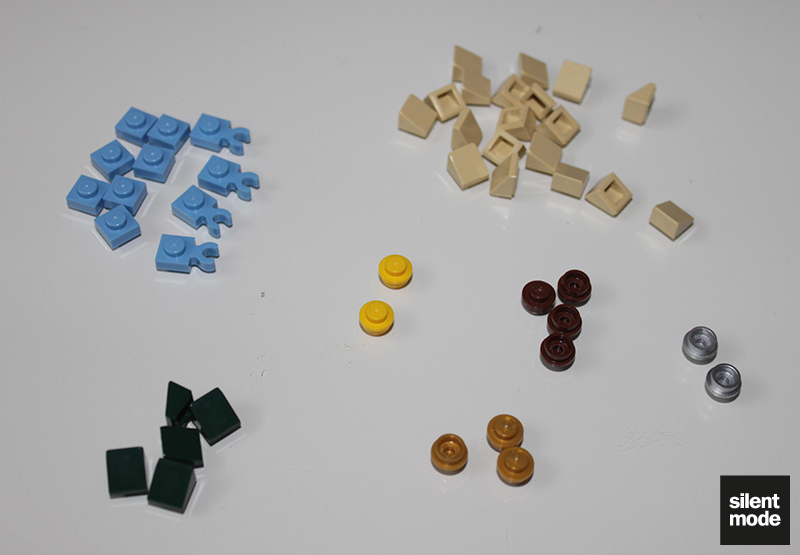 I forgot to include the five dark green cheese slopes before, but we also have metallic silver, reddish brown and pearl gold studs, and a few more medium blue elements. I haven’t seen those trees come in a set in years (bearing in mind I don’t usually buy sets), but they’ve made a very welcome return. It’s been a long time since I’ve handled a tree that hasn’t been chewed. 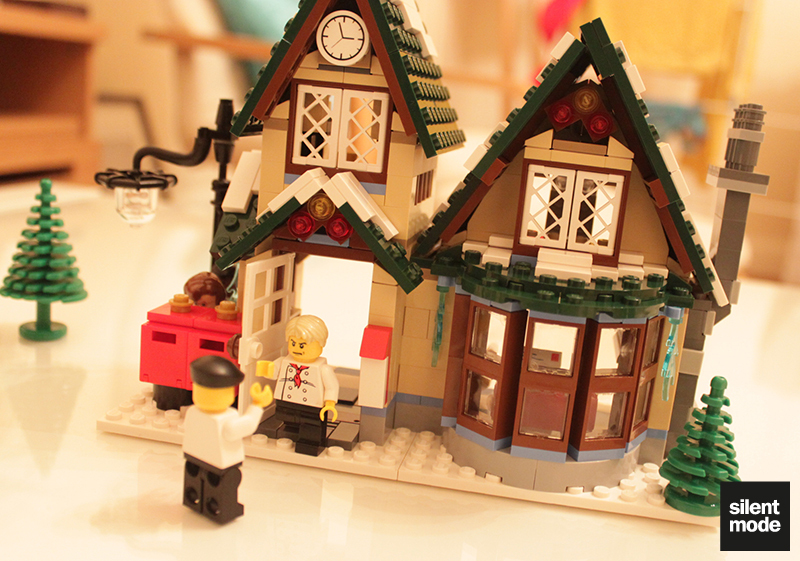 We’ve got four trans light blue “flame” parts that serve as icicles, the new lattice window panes, three of this year’s new clip plates, two “burglar” sacks and a black lamppost. 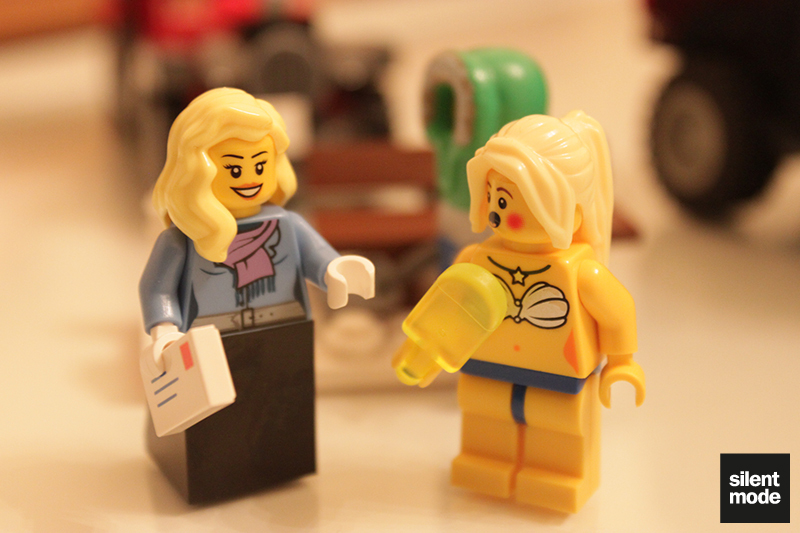 A very nice addition is the sought-after “Elsa”* blonde hairstyle, as well as the clear minifigure head. 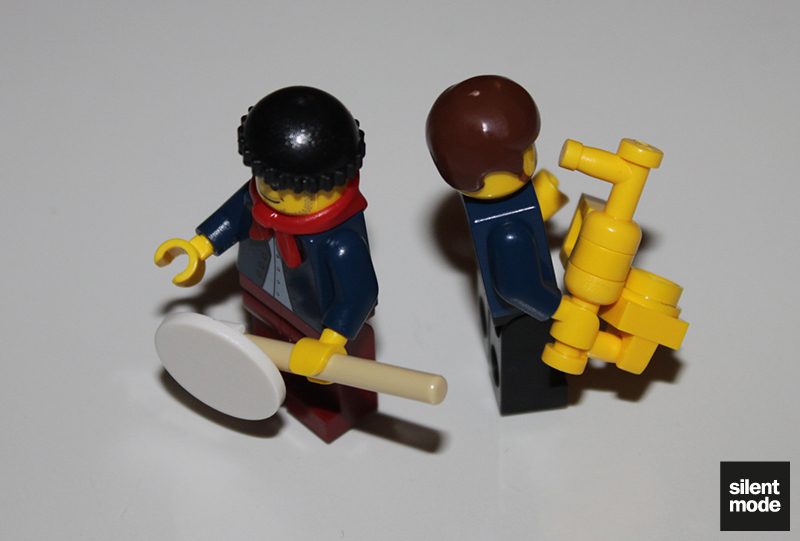 And of course, no set would be complete without a bone and four heavy-duty bazookas. 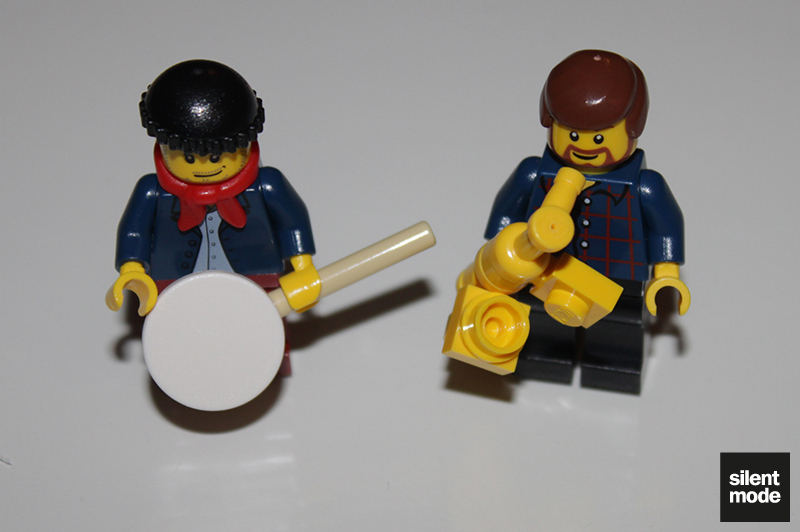 Finally, you’ll also see we have two distinct minifigure heads and two new torsos. I’m fairly certain they’re new prints but someone’s bound to correct me. * Trivia for those who don’t know: I was told this hairpiece was actually modelled after Megan Rothrock, a very talented designer at TLG. 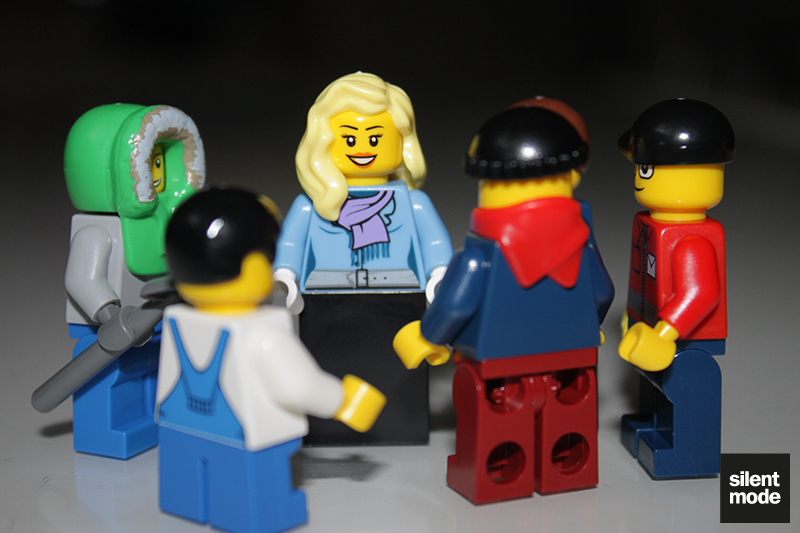 It appears that the male figures are completely smitten by the blonde female, which hasn’t resulted well for the female postal worker. I have to admit, the blonde looks good! 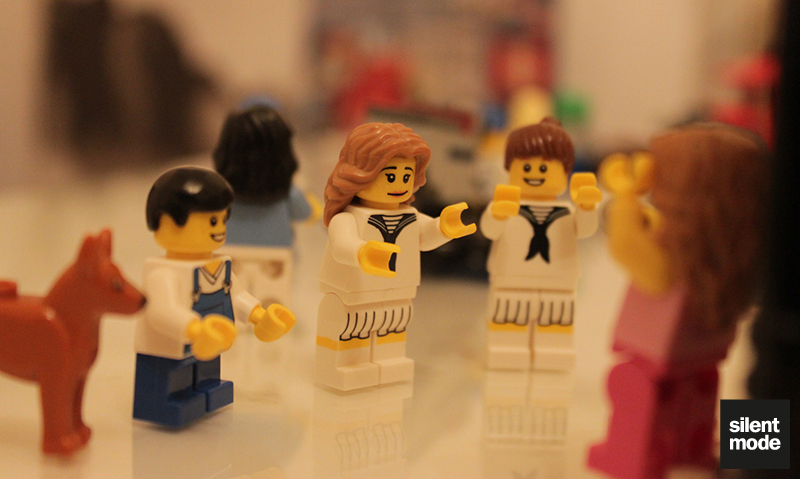 If I can eventually tear the guys away, you’ll see more of them a bit later. 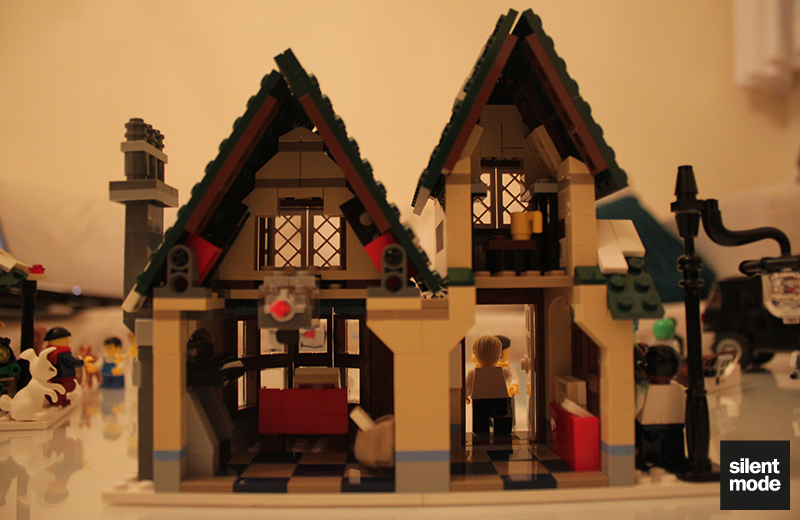 The Winter Village Post Office comprises of four different models; we’ll go through them in the instruction manual order. 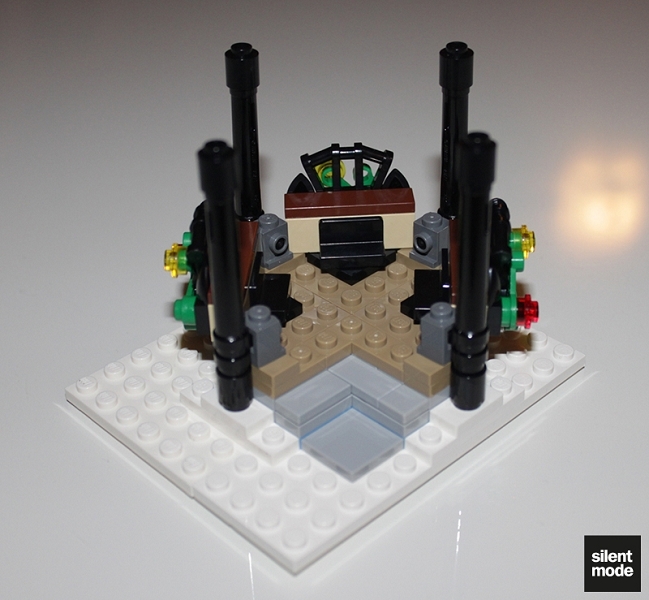 So we start things off with a very simple build; this model takes only around 20 pieces. 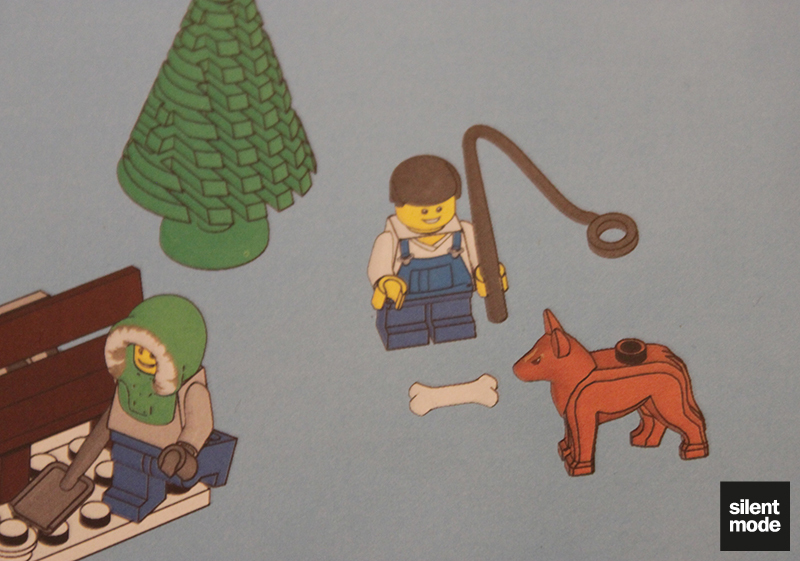 It incorporates a male in a mismatching bright green hood (the same one as in the 2011 City Advent Calendar) and light bluish grey jacket, a young boy and a dog. 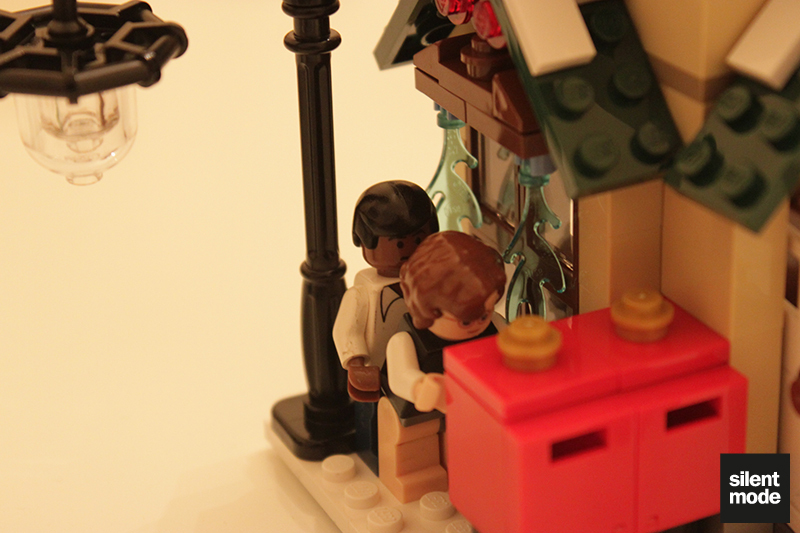 This scene probably represents a small park or a roadside bench. This doesn’t look like any post office van I’ve ever seen, but it’s a neat little model. 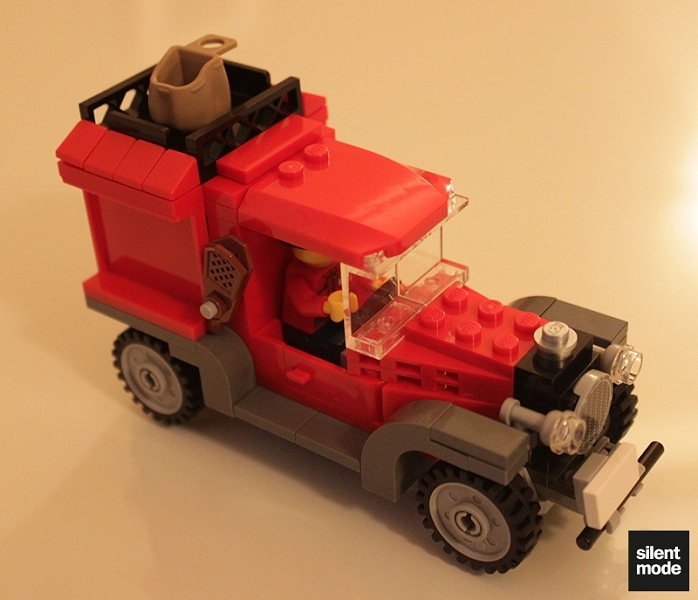 This vehicle is the preserve of the male postal worker, who wears a black cap. The van is home to a couple of gift boxes (one of which doesn’t actually fit in the van with ease), and inexplicably a burglar sack sitting on top. Also on the right side there are a couple of attached snow shoes in reddish brown: at first I thought they were part of some elaborate engine, but it turns out they’re actually for the postal worker to wear in snowy conditions. Duh. Many of the stickers would go on the van (the red panels and licence plate), but as mentioned before I don’t apply them. 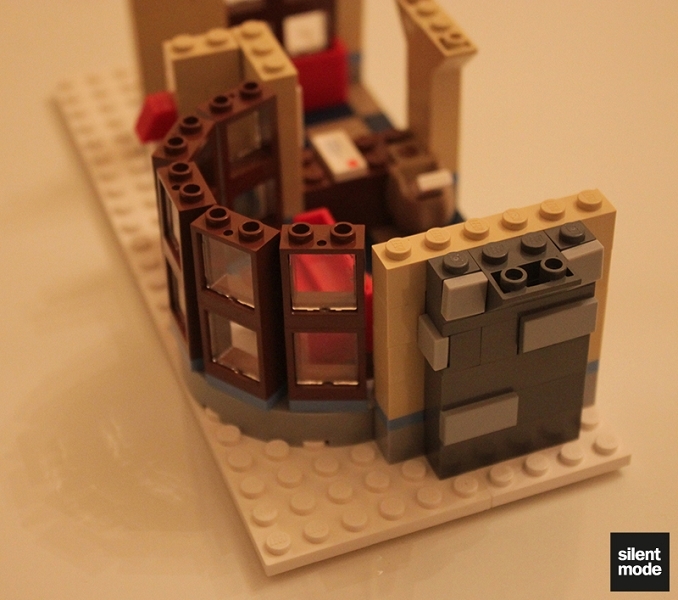 This is one of the more complicated models, so it effectively comes in two parts. The first is the base, which explains the presence of four large bazookas, and the second is the roof containing the massive star. One thing to watch out for when placing the roof: the bazooka pieces fit into the small peg, rather than the last hole, underneath the tan parts. 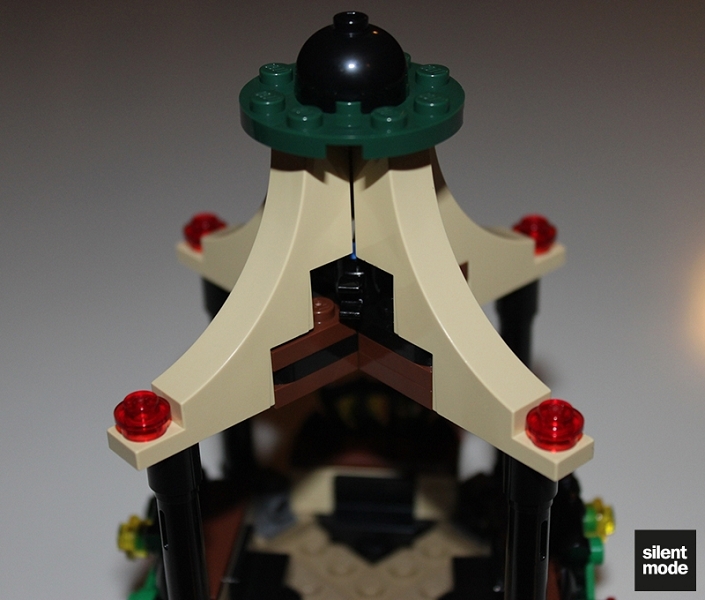 This wasn’t made very clear in the instructions, but if you try to fit the bazookas on the ends of the tan arches, you’ll break the structure. This bit is rather tricky. 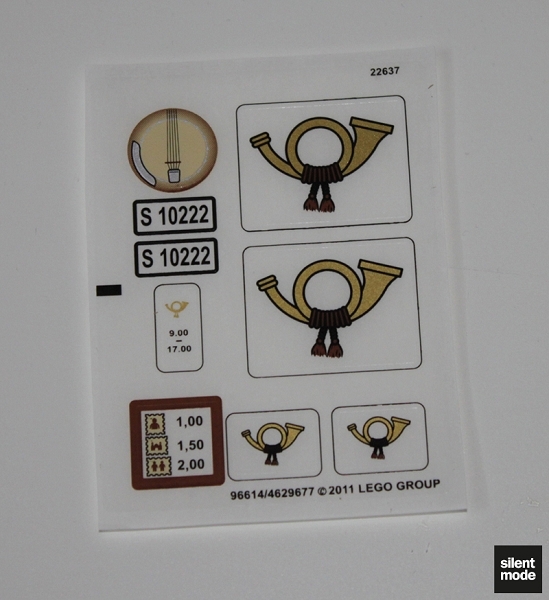 I wasn’t keen on the instruments in preview pictures, but I’m rather impressed with the saxophone construction in this set. At least, I’m pretty sure it’s a saxophone. It could actually be something that requires a lighter. This bad boy is constructed in several parts, most of which I’ve tried to show in the pictures below. It takes a while to see it forming, but it’s well worth the time. 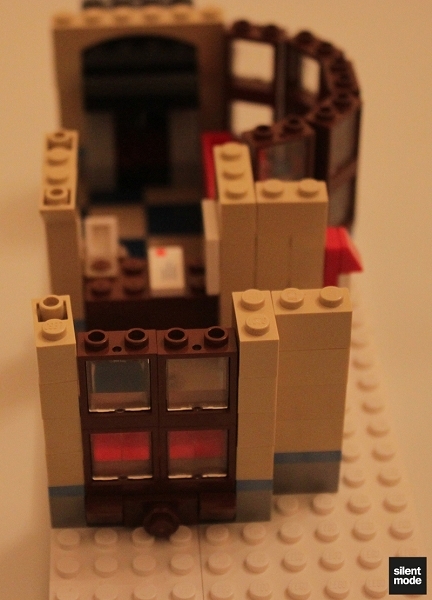 The first part is obviously the ground floor, which includes the interior and the windows. There’s 14 of those small windows to construct, and it’s very interesting to see how the front ten are arranged to give that curved shape. 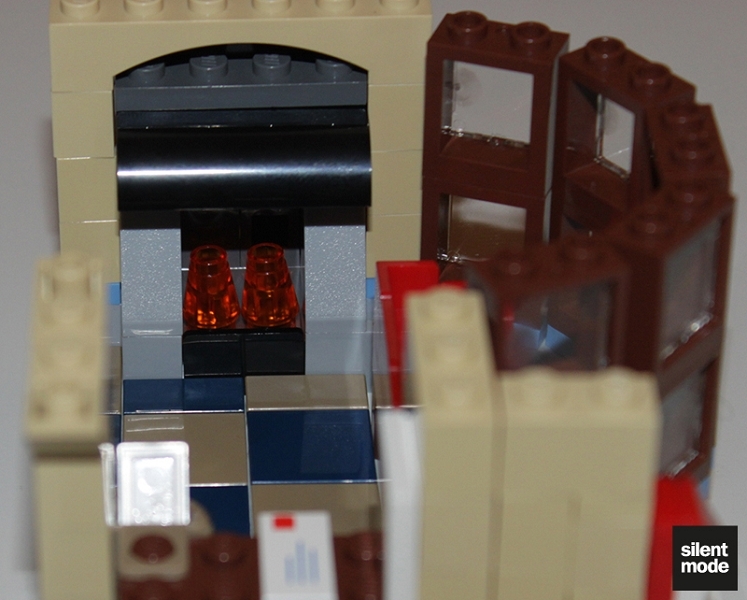 The interior is tiled with alternating dark tan and dark blue tiles, and even includes a fireplace. After that we look at making the roof. 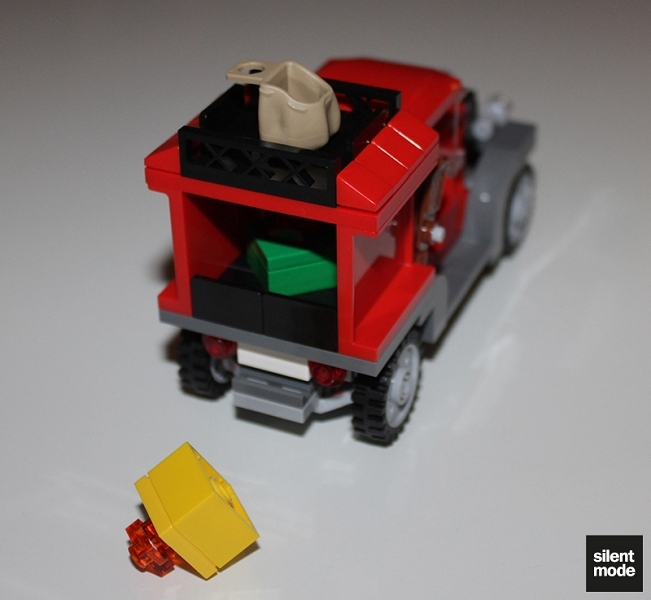 This is achieved with some Technic parts on the building and under the green plates, held together by 1×4 axles. We do the same thing for the other side of the building, which contains a very small solitary room. This side also has an analogue clock. 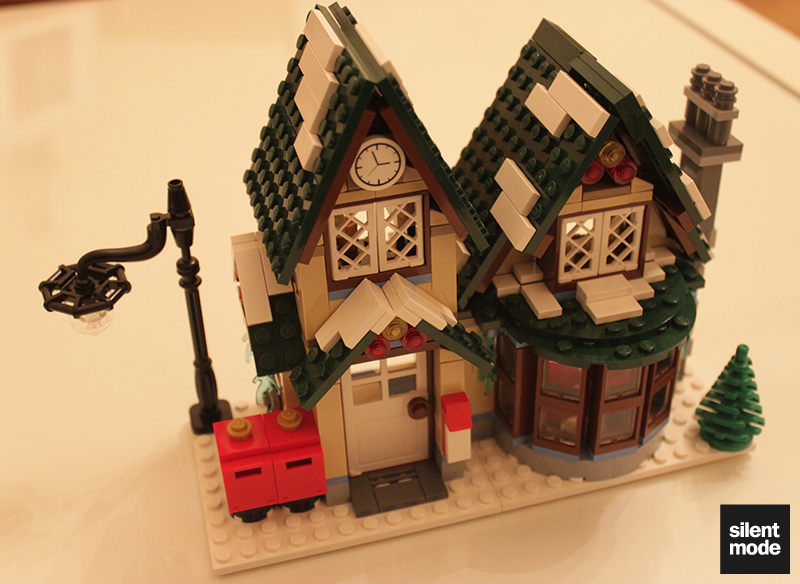 With the building complete, we finally add the peripherals: the small tree goes in one corner, two postboxes are put out front, and we add a classic lamppost at the back. 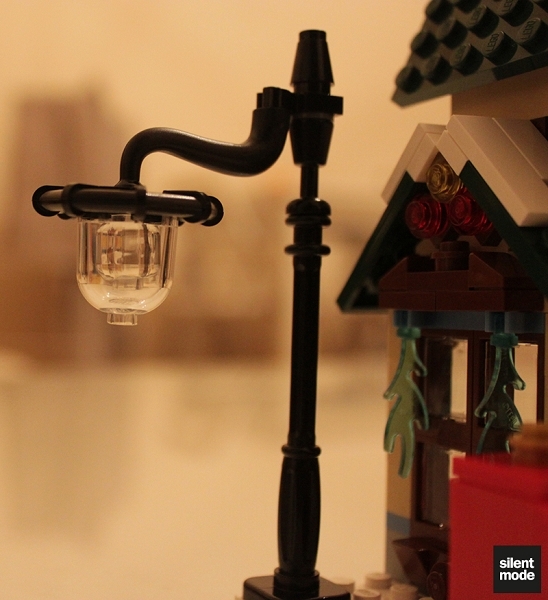 The lamppost’s construction is very simple but effective, making use of that odd “elephant trunk” black piece. Pretty much one of every cheese slope and round plate, and a couple of 1×1 tiles for the journey. 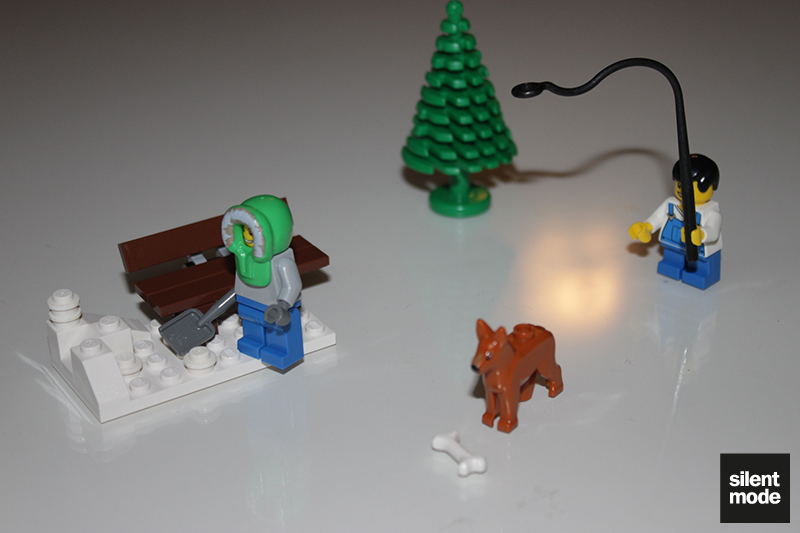 Here’s what happens if you combine this set with the Winter Village Bakery. 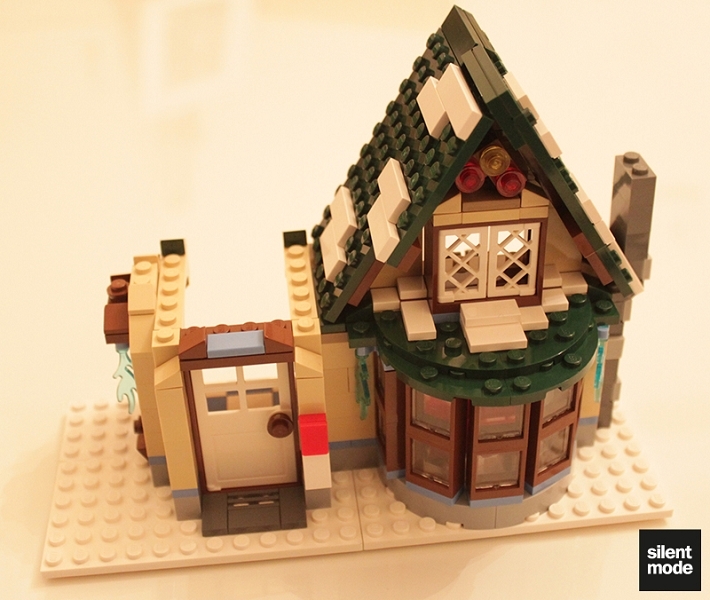 Two of this year’s Creator sets, along with those highly-popular modular buildings. 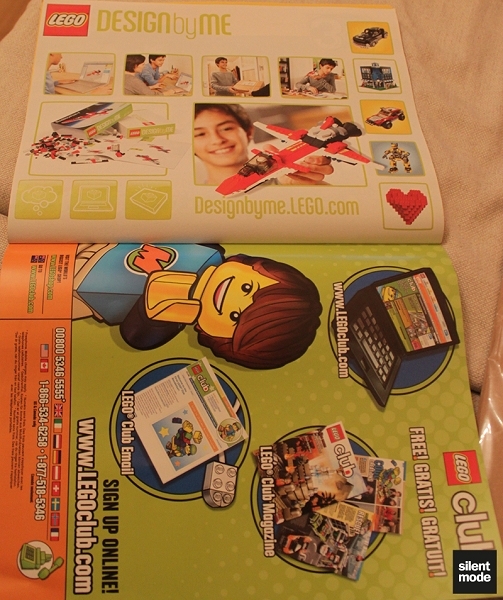 An ad for DESIGNbyME, along with an invitation from the Ashton Kutcher of Lego to join the Lego Club. This is my favourite bit, and I promise there are no gorillas involved. 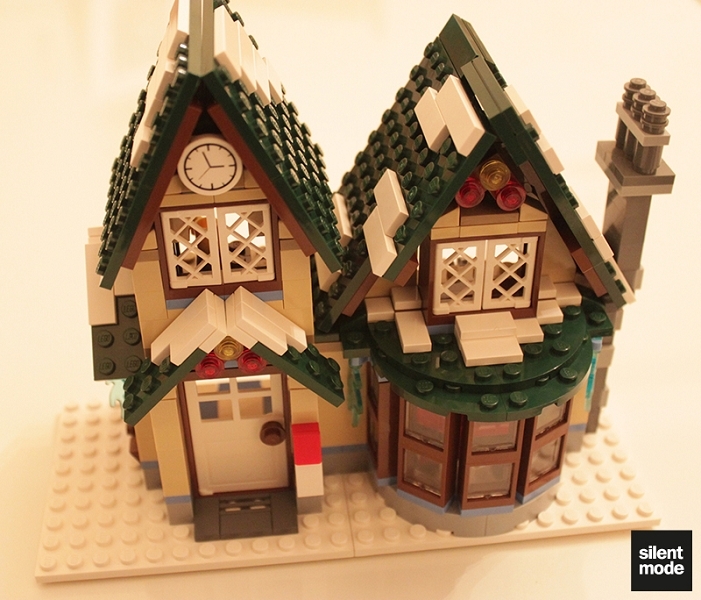 I missed out on both the Winter Village Toy Workshop and Winter Village Bakery last year, and while they are back again this year they’ve reverted to their original prices (GBP 40.99 and 44.99 respectively). 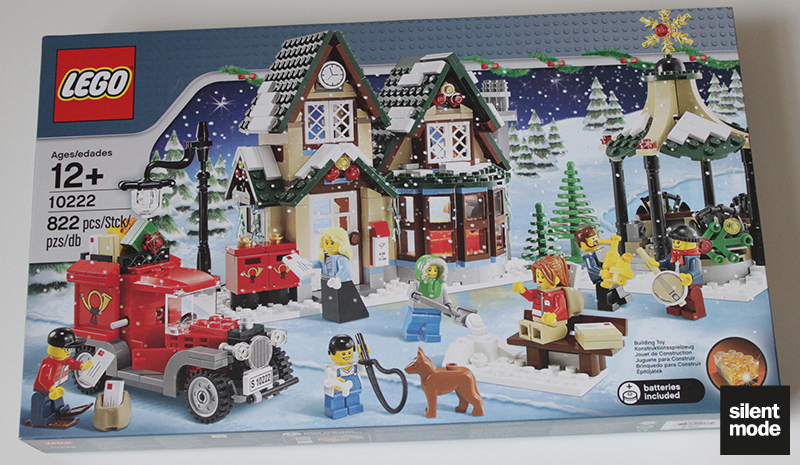 The Winter Village Post Office is the most expensive of the Winter sets out at present, and normally I wouldn’t buy a set like this at full price. 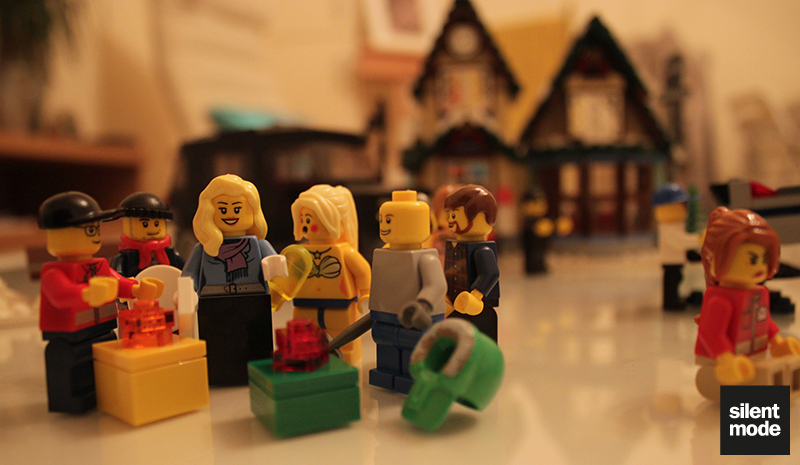 The main draw for me, particularly towards the Toy Workshop, was figuring out how the models were built. 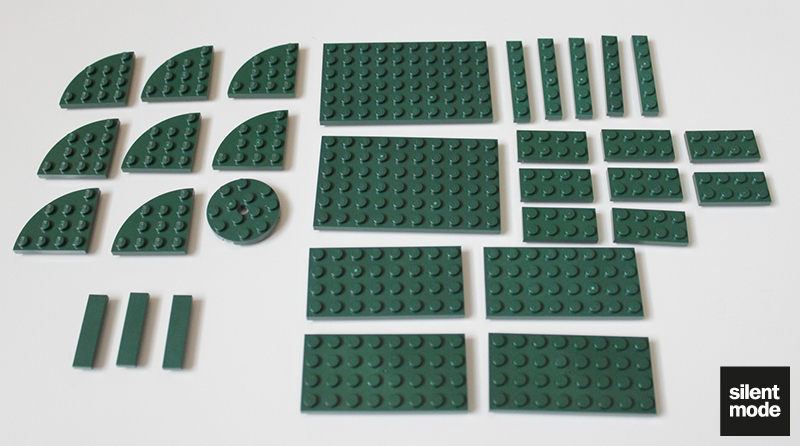 Unlike other sets I’ve reviewed, I do think I got my money’s worth with the Post Office: it’s reflected in the selection of parts, particularly with all the dark green elements and various sized and coloured tiles. 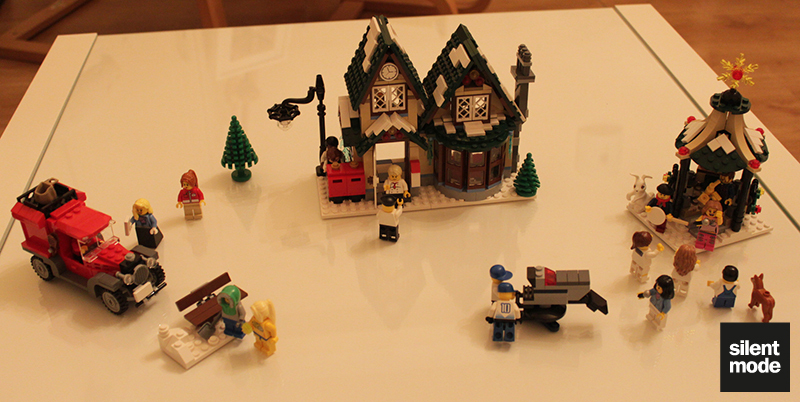 The set itself makes an excellent wintery display on its own, but imagine what it would be like with the Toy Workshop and the Bakery combined. 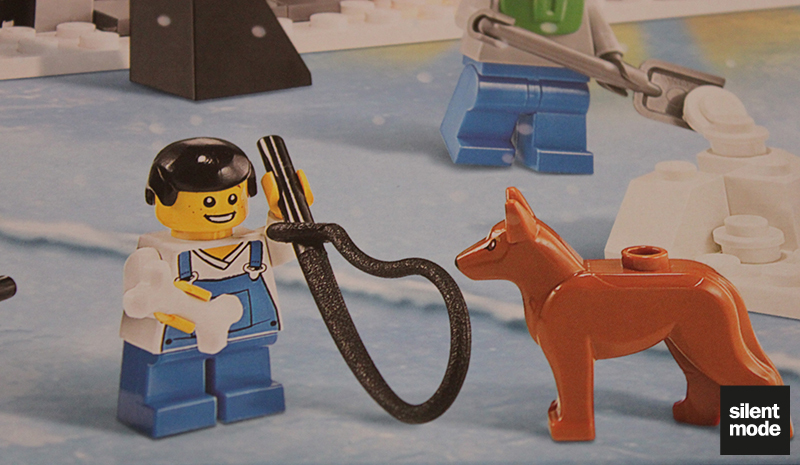 The highlight of the set for me is easily the new minifigure prints – along with the S5 Snowboarder’s torso and the bright green one in the City Advent Calendar, we could use more designs. 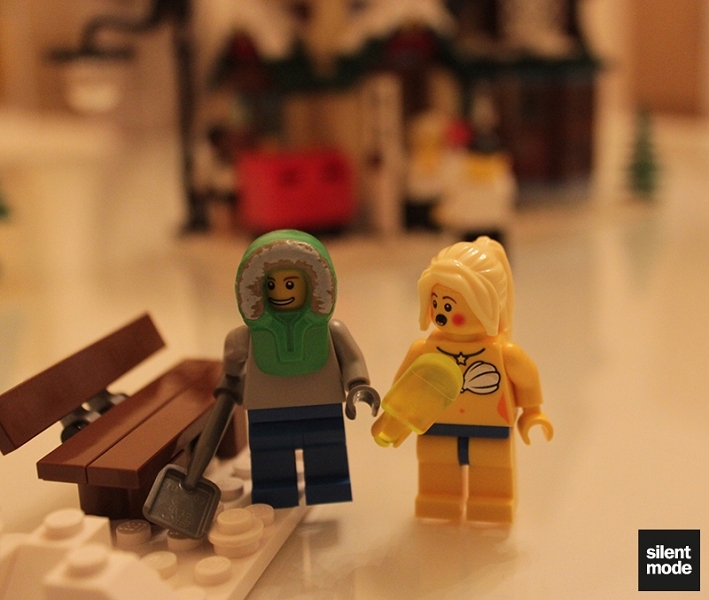 Bring on a City skiing theme! 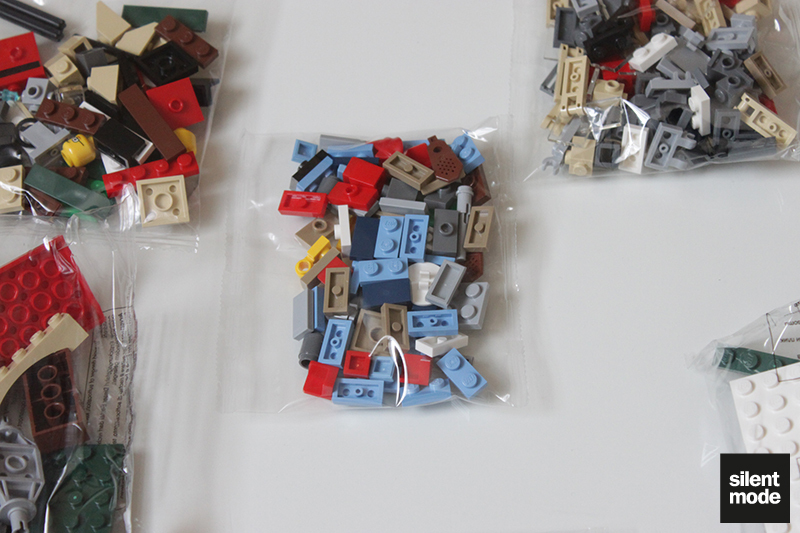 The first is that we could really have used numbered bags for the different models. 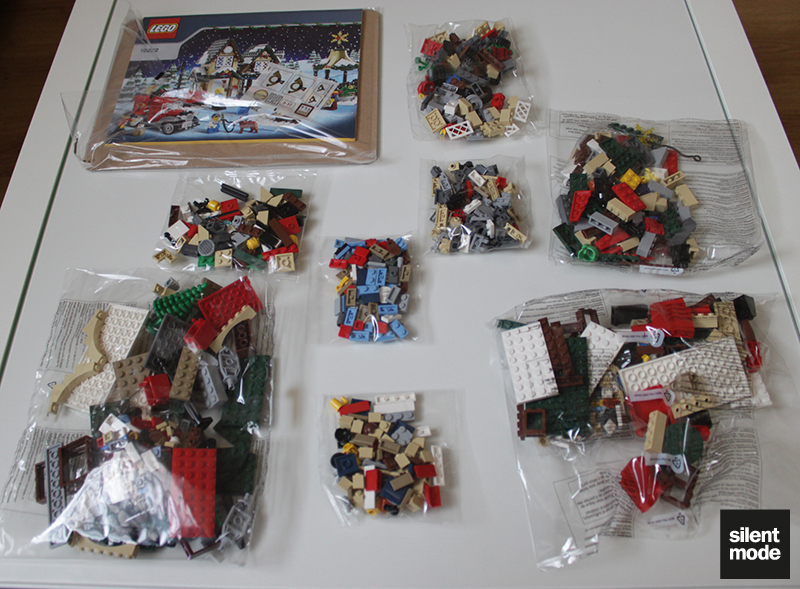 As it stands, the different parts – especially the small ones – are all mixed together in different bags. It made finding particular small parts (and there’s a heck of a lot of them) very difficult, even in sunlight. 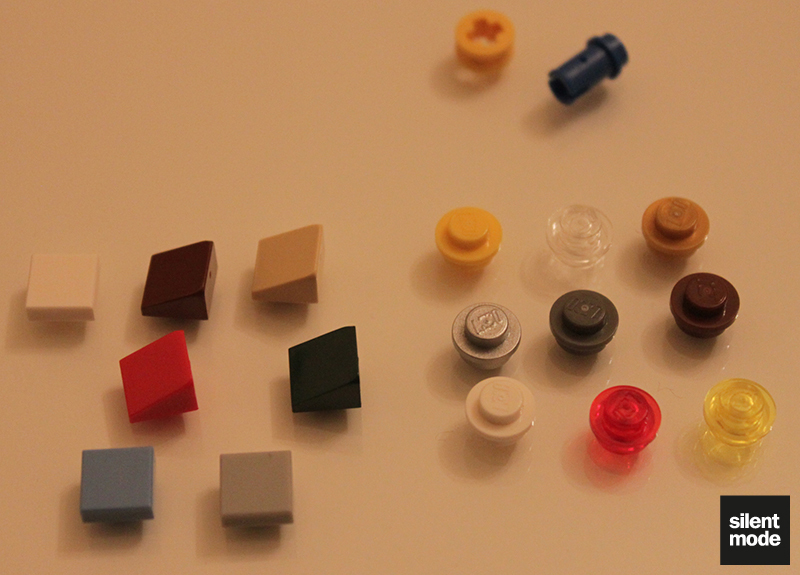 The second is the quality of the instruction manual: it might be my eyesight, my inexperience with newer sets or the yellow indoor lighting, but there were times when I couldn’t tell which colour parts to use. This particularly happened with black, grey, dark tan and especially the transparent colours. 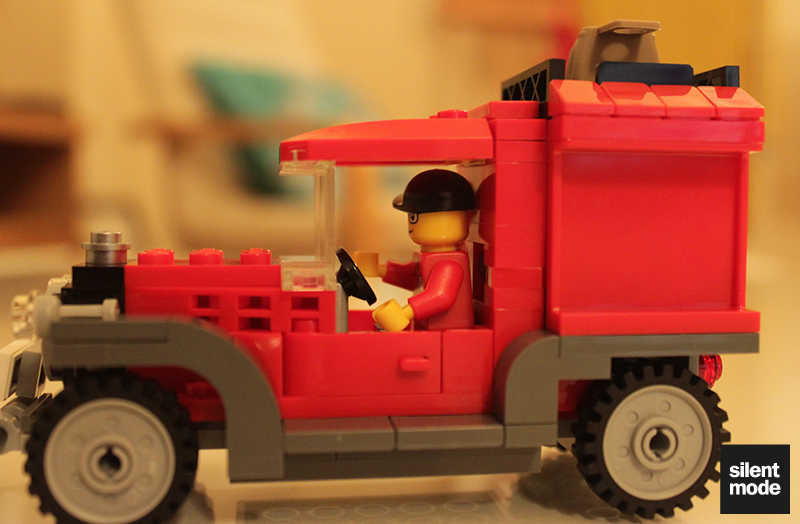 It might also have to do with the many hours spent this week creating my own instructions. 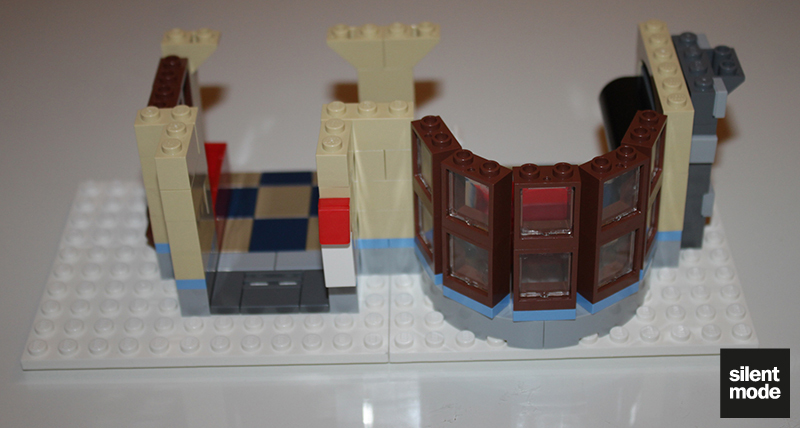 Either way, these two drawbacks meant that the build (along with taking photos) took two or three hours. A very good-looking series of models that would be great as part of a wintery display - or even on their own. 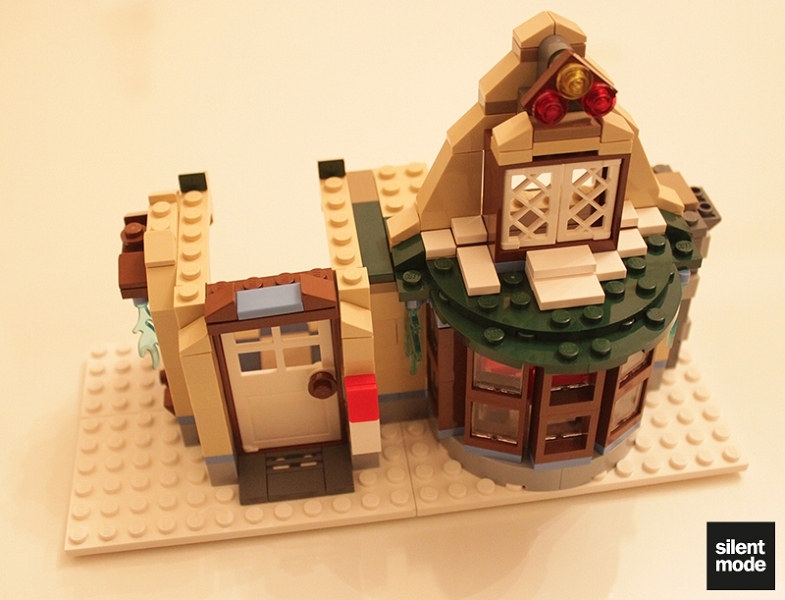 A reasonably good set to pick up building techniques from. 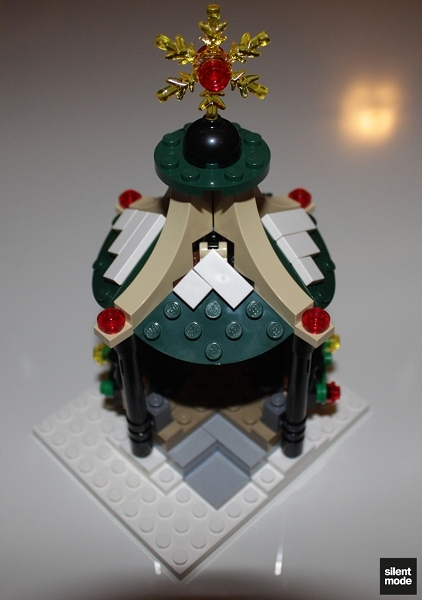 The combination of numerous small parts, mixed bags and instructions means increased building time. 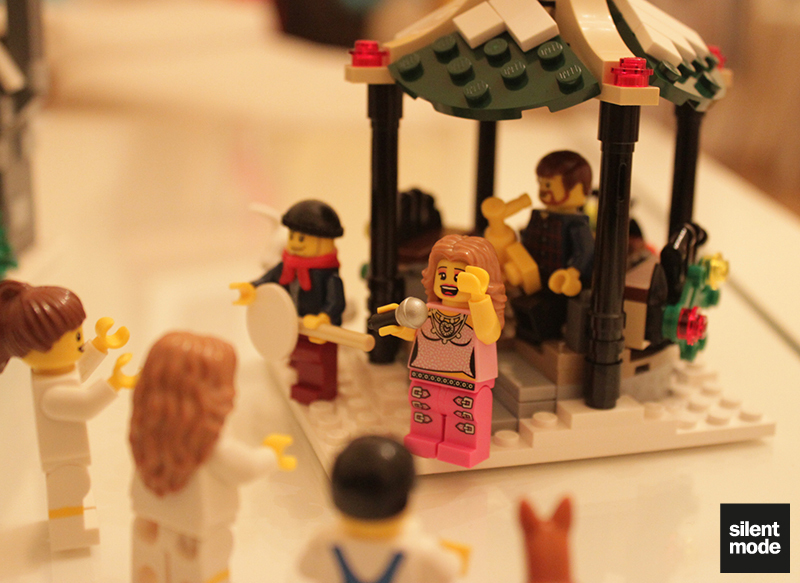 Many many parts stood out on their own in this set, but there's something for everybody. 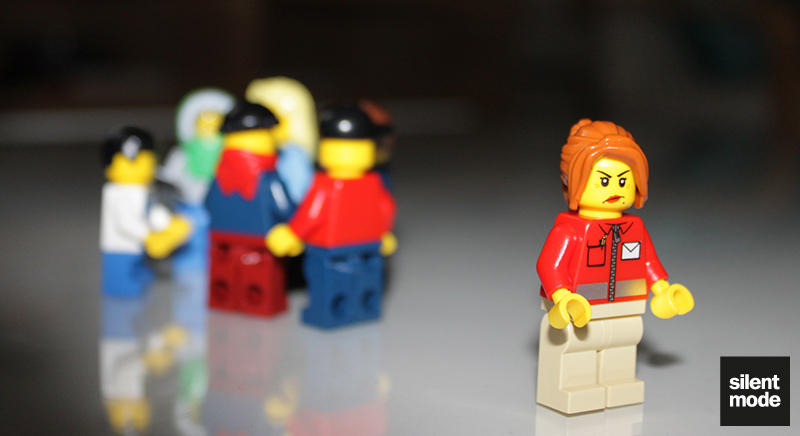 The female blonde stands out as perhaps the best City minifigure this year. 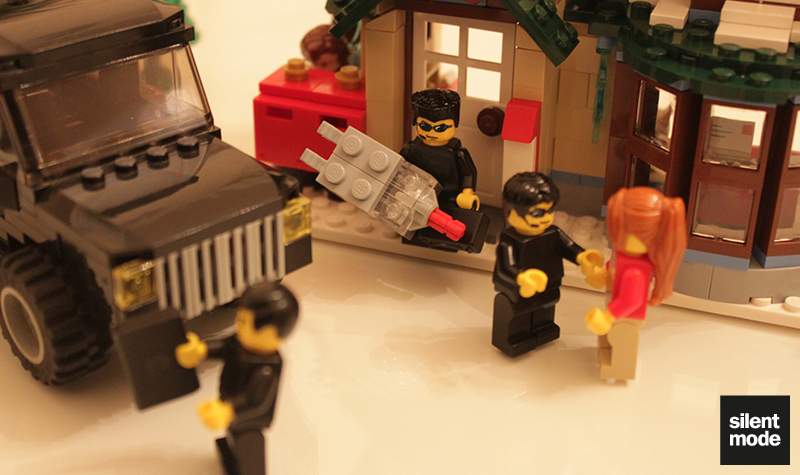 Some might find the spare parts underwhelming, compared to the 2011 City Advent Calendar. 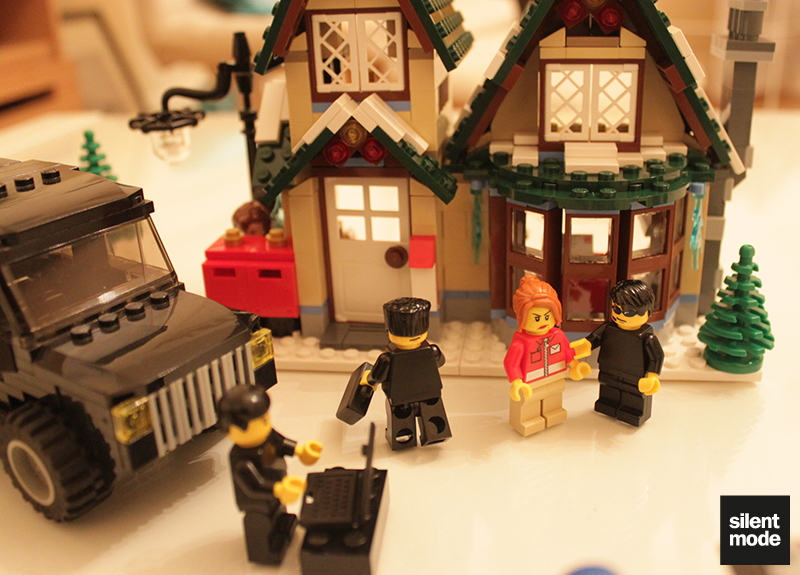 Apart from the van I think the models themselves (especially the post office) are more display pieces. 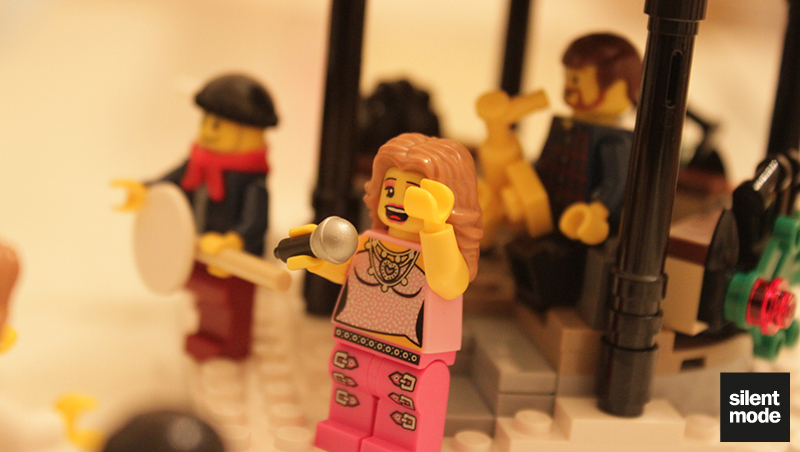 The minifigures can easily be adapted. 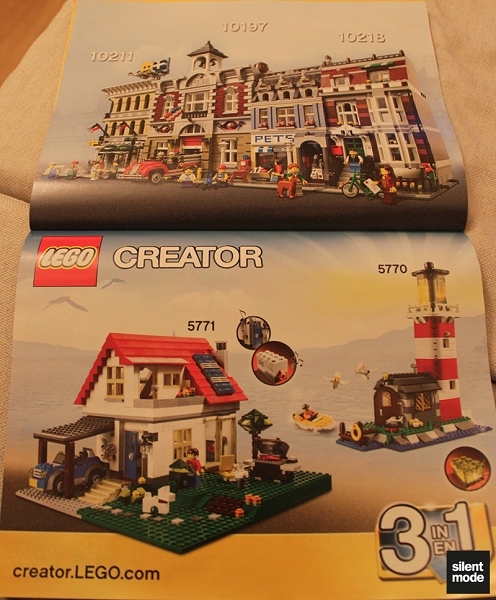 I think this set could have been a little less expensive, perhaps the same as the Bakery (GBP 44.99), but for the parts it's okay. Based on these scores I’d give this set a reasonable 8.0/10. And that’s it. It’s almost 4am; I’m off to bed. 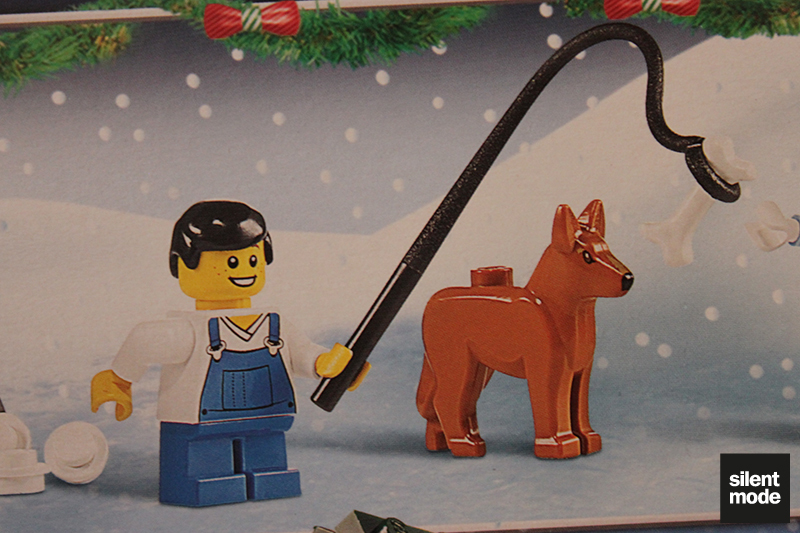 A golden age when little boys would attempt unspeakable things with pet dogs.